Continuing from the popular mixed chorus version, long waite d male chorus version is published. 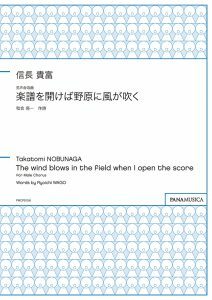 It was written as the co ntinuation of "From the Dawn to Nightfall“ in commemoration of the 70th anniversary of the Fukushima Choral Association . This male chorus version show how dramatic the song is an d having the big scale of music even more than the mixed cho rus version.